a me piace essere gemellato con voi di San Pietro noi ne sappiamo molto dei mandala e abbiamo abbelito anche con diversi mandala la scuola un salutone GIACOMO. Hello My name is Thomas. A scuola stiamo studiando i mandalas ... Mandala is a sanskrit word which means circle or " wheel "... Do you know it? Ciao,sono un accademico e mi piacerebbe tanto gemellarmi. siamo contenti di essere gemellati con voi. My favourite animale is horse. My name is Enrico i' m 9 years old. My favourite sport is swim. I' m from China. I' m Chinese. I' m short and My hair is black !!! Ciao!!!!!!!!!! My name is Davide. I'm from Cividale. I'm eight years old. I've got one brother, Alessandro. I like chicken and pizza. My name is Alessandra. I'm from Cividale. I've got a sister. I like pizza and chips, I don't like spinach. I've got three cats. My name is Nina. I'm from Fragellis. I'm eight years old. I've got two brothers. I like pizza. I don't like cheese or bananas. My favourite food is salad. I've got three dogs and two cats. My name is Samuel. I'm from Cividale. I'm eight years old. I've got one brother, Joshua and one sister, Eden. I like pizza. I don't like cheese. My name is Biagio. I'm eight years old. I'm from Tribil. I've got one sister, Dana. I've got one cat. My favourite food is pizza. I don't like cheese. I like snow. My name is Marzia. I'm from S. Pietro. I'm nine years old. I haven't got sisters or brothers. I like pizza. I don't like soup. My favourite food is fish and chips. I've got one cat. My name is Mirko. I'm from Sottovernassino. I like chips. I don't like chicken. My favourite food is pizza. I haven't got a pet. I like DS. My name is Aurora. I'm from S. Pietro. I'm eight years old. I've got a rabbit. I like chips. I don't like soup. My favourite food is pizza. My name is Samo. I'm from Sorzento. I'm eight years old. I've got a dog and a turtle. I like chips and ice cream. I don't like spinach or tomatoes. My name is Asia. I'm from Firmano. I'm eight years old. I've got a cat. I like English. I don't like Geometry. My favourite food is bananas. Sono Marzia e saluto tutti quanti voi! Siamo proprio una classe fantastica....anzi: "Fantastic twenty four"!!!!!!!!!!!!!!!!!!!!!!!!!!!!!!!!!!!!!!!!!!!!!!!!!!!!!!!!!!!! DEMETRA CE L'HA FATTA!!! SIETE GEMELLATI E NIENTE PO PO' DI MENO CHE...CON GLI ACCADEMICI CREATIVI! CORRETE a conoscerli, visitate la loro pagina nella lista degli accademici e accoglieteli con tutti gli onori nel vostro blog ora unito! Hello, my name is Aleksandra. I'm from Stermizza. I'm seven years old. I've got two twin brothers. I like cakes but I don't like soup. My favourite food is pizza. I like horses. I've got two parrots and five dogs. Hi, my name is Gioele. I'm from Spessa. I'm eight years old. I've got two sisters, Ginevra and Virginia. I've got four cats. I like pizza I don't like bananas. My favourite food is fish. My name is Daniel. I'm from Savogna. I'm eight years old. I've got one cat, Maya. I like pizza, I don't like salad. My favourite food is chicken. My name is Vittoria.I'm from Cividale. I'm seven years old. I've got a sister, Virginia. I like pizza but I don't like soup, my favourite food is chips. My name is Anita. I'm from S.Pietro. I'm eight years old. I've got one brother and one cat, Milva. I like chicken but I don't like cheese, my favourite food is fish and chips. My name is Sofia. I'm eight years old. I live in Cividale. At home I speak English with my mum and my relatives. My favourite food is fish, I don't like cheese but I like carrots. My name is Denis. I'm from Tamoris. I'm eight years old. I've got one dog and three cats. I like pizza, I don't like soup and my favourite food is chips. ?ao accademia sono Samo e sono un accademico e vado in classe 3a e mi sa che vi devo salutare. 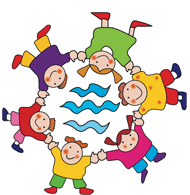 Ciao,siamo i bambini della 3 classe della scuola bilingue. Sono Denis e sono un accademico.